My most recent suitcase experience came as I was trying to figure out how best to wean Zac, who is old enough by conventional standards to be off the bottle. The proper mothers in the flock are just letting nature take its course, and most are still nursing their lambs on demand. I think the demand is slackening, but it's hard for me, as occasional visitor to the flock, to be sure. Zac with Robert a few days after rejoining the flock. A few weeks ago, I repatriated Zac and his babysitters Clara, Robert and Johannes into the flock, though I kept taking bottles out to Zac just once a day, in the morning. After 10 days of so of that routine, I decided I could reduce his milk gradually and wean him over the course of a week or so. The first thing I changed, though, was nearly disastrous, and certainly nothing a proper mother would have done. 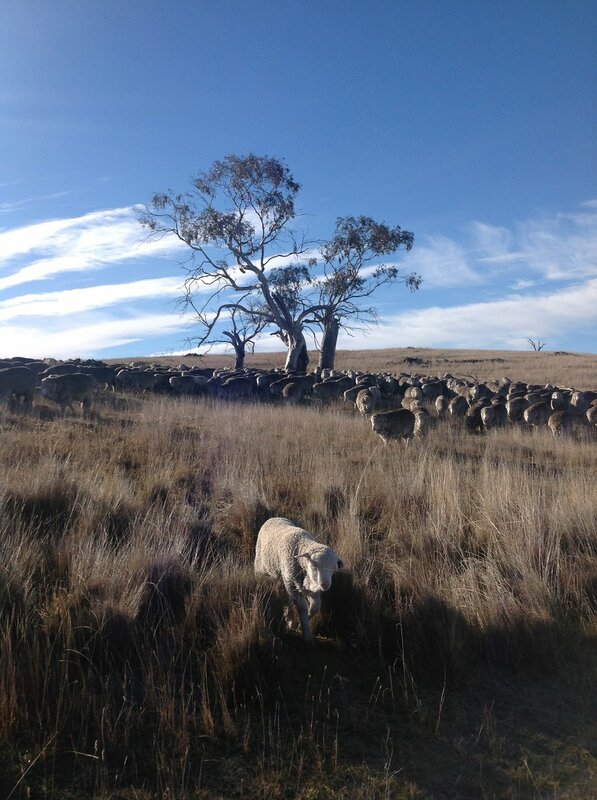 Zac "leading" the flock--really just following mama suitcase--from the Grass Gully into White Gum Wood. Instead of keeping the formula the same and just reducing it over time, when I ran out of cream one morning, I just left out the ¼ portion of cream and egg that I've been giving Zac right from the start. The next day, he only drank a small amount, and was clearly not quite right. The third day he wouldn't take anything at all, and was dispirited and whiny--not his usual bubbly self. It wasn't until that afternoon that I finally figured out I caused the problem: he was really constipated, poor guy! It took several days back on the right formula to get him back to 100%. Since then, about 10 days ago, I haven't had the courage to try to reduce the quantity in his morning bottle--I'm just so relieved that he's drinking it and looking well. So, I award myself three suitcases (anti gold stars) for not paying proper attention to the details of nutrition!